northern virginia Archives - Read. Think. Act. 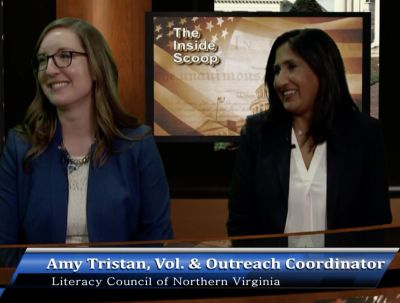 (March 5, 2018) Catherine Read interviews Roopal Mehta Saran, Executive Director of the Literacy Council of Northern Virgnia (LCVN), about the numerous programs and services being offered in the Northern Virginia area. 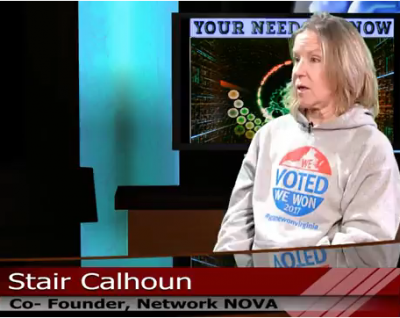 They are joined by Amy Tristan, Volunteer and Outreach Coordinator, in the last segment where they discuss the numerous ways individuals, organizations and companies can engage with LCNV. 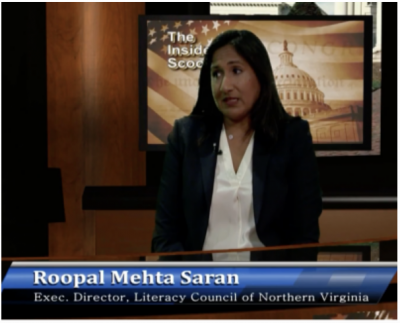 The Literacy Council of Northern Virginia is 55 years old, and Roopal Saran has been at the helm of the organization for the last six months. There are over 36 million American adults that don’t have literacy, writing or math skills above a 3rd grade level. 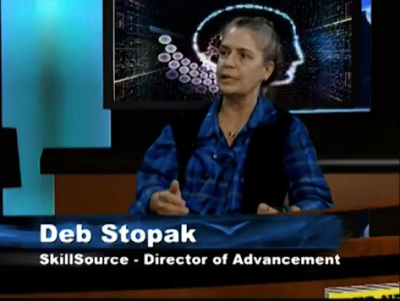 Some those adult learners are native English speakers and some are native speakers of many other languages. The Northern Virginia area is multiculturally very rich with over 100 languages being spoken in classrooms and homes around our region. Adults learning English as a second language may or may not have literacy skills in their native language. LCNV’s Beginning-level English classes teach the foundational skills adult English Language Learners (ELLs) need to learn to speak, understand, read and write English. 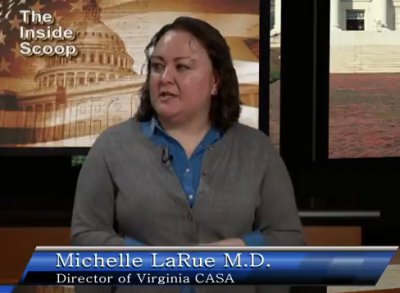 Classes are taught in multiple locations – in places such as the James Lee Community Center where LCNV has offices, in schools such as Crestwood Elementary, and spaces provided by collaborating non-profits such as Connections for Hope in Herndon, VA. The idea is to take the classes to meet the people where they are and where it’s easy to get there using public transportation. There will be new classes starting out in the Centreville area in early 2018. LCNV is also collaborating with local companies in workforce development training through increased literacy that is both industry and company specific. Destination Workforce® training for B.F. Saul Hospitality Group’s Doubletree by Hilton at Tyson’s Corner focused on their housekeeping and banquet employees. The program provided instruction on language and cultural tools to provide better staff interactions with customers through the B.F. Saul “Know Your Hotel” framework. LCNV has also partnered with Goodwin House in Bailey’s Crossroads and with other local business to craft specific literacy programs that are job specific. The Destination Workforce® program is also working with the City of Alexandria to help newly arrived refugees with basic English literacy in preparations to more quickly prepare for entry level job opportunities. Amy Tristan spoke about the hundreds of literacy volunteers that make their programs possible. Many have been with LCNV for over a decade and they are always looking for new volunteers who are interested in taking the training to be classroom instructors, to offer small group tutoring and also conversation classes. There are programs to meet that time and location preferences of a variety of volunteers and they welcome companies who encourage their employees to engage in community volunteerism. LCNV also welcomes the opportunity to collaborate with other organizations and non-profits who serve clients with basic literacy needs. 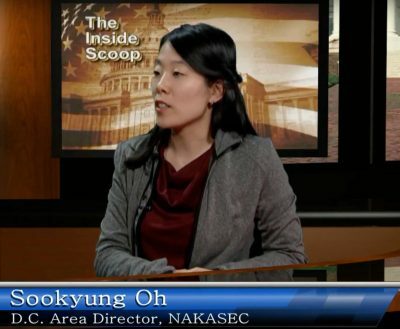 (Feb 26, 2018) On this episode of Inside Scoop, Catherine Read talks to Restorative Justice experts Vickie Shoap, Bill Casey and Dave Deal about what Restorative Justice (RJ) is and how it is being applied in Fairfax County Public Schools and by the Northern Virginia Mediation Services. 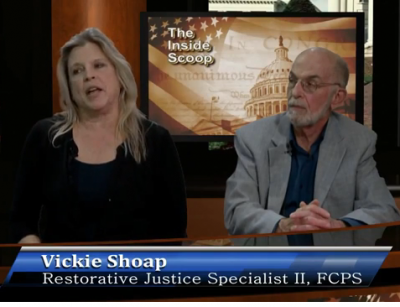 Vickie Shoap is a Restorative Justice specialist working for FCPS, on their Restorative Justice Initiative which deals with the school system’s disciplinary process. 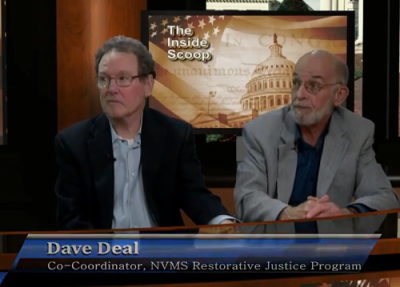 Bill Casey and Dave Deal are co-directors of the Northern Virginia Mediation Service Restorative Justice Program, and work with the county on the Alternative Accountability Program, which provides an alternative to criminal charges for first time offenders. Restorative Justice is a philosophy of dealing with misdeamors and minor crimes by examining the situation through a different lens. Where traditional justice does an investigation then punishes the responsible party exactly according to the law. Restorative Justice examines individual harm, who and how were they harmed, then bringing them together with the one who did the harming. In school, they use it for all forms of conflict, using it to prevent the escalation of situations. They also use it to respond, letting those who were harmed talk about what they experienced and what exactly it meant to them. It brings offenders face-to-face with the realities of what they did. It creates a conversation which can be very difficult to have, especially for children. All of that is with the ultimate goal of repairing the harm and making the situation right and prevent the situation from occurring again. Restorative Justice is an old method of seeking to address wrongs which was suppressed under zero-tolerance policies. The traditional method was, when an offense had occurred, to gather the community and discuss how to repair the harm and restore relationships. They built upon a notion that everyone is connected, ultimately, it’s about developing empathy. 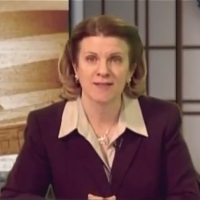 In modern society its hoped that by applying Restorative Justice techniques that there can be a reduction in recidivism and a reduction in punishments which don’t actually achieve their goals. For example, it has been suggested that out-of-school suspensions fail to serve anyone’s needs, the student who is suspended simply gets free days, while they fall behind their school work and does nothing to solve the underlying issues. 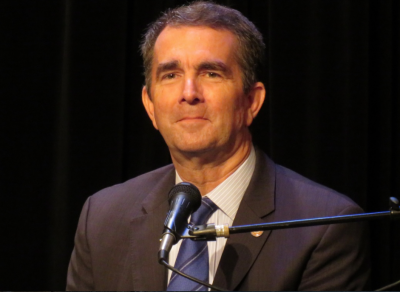 That idea has gained enough traction that the Virginia State Legislature is looking at addressing an excessive number of suspensions. 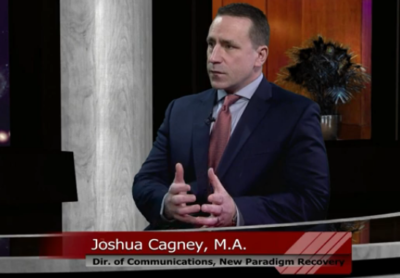 Traditional punitive methods create a stigma around the offender, preventing them from properly integration back into the community even if they have done their time and learned from their offenses. Restorative Justice focuses on the victim as well as the offender, then those who were affected by the fallout. The needs and harm done to the victim is addressed, which traditional methods frequently ignore in favor is just punishing the offender. Restorative Justice is about making the offender acknowledge their offense and contribute in some manner to repairing the harm done by their actions. Generally, students will still be in the same class together, so it is important to work out their differences and resolve the issues before things escalate. Applying Restorative Justice to various situations turns punishment into an educational process, especially for students. In Fairfax County, the school system has been applying Restorative Justice to their correctional process in aid of developing social skills and empathy. They feel that traditional out-of-school suspensions teach students that simply staying at home is better than facing situations where they come into contact with those they may have harmed and further that the traditional suspension is based upon the idea of isolation, something which modern technology makes a near impossibility and does nothing to solve potential ongoing conflicts or prevent escalation. Data has shown that repeated suspensions in middle school triples the probability those students will be involved in the juvenile justice system. By having face-to-face conversations with those they wronged, students are taught exactly what their actions have caused and about resiliency, social responsibility and empathy. Discipline is supposed to be educational, to teach students how they can be better, rehabilitation, not necessarily about the punishment itself. Zero tolerance policies came to the fore in the 1980s initially relating to the drug issues in society, but over time became too rigid. 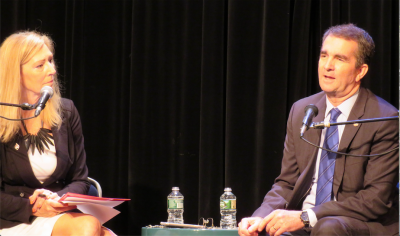 Juvenile offenders and school offenses became lumped in to the need for punishment and created a situation where offenders became isolated from the community. They also made no allowances for children acting as children sometimes do, turning relatively minor learnable situations into larger situations. The policies were about punishing offenders but did nothing to address restoring the damage done. It became so harsh that offenders failed to learn while those harmed did not have their needs met. FCPS has been working on a Restorative Justice policy for almost ten years. 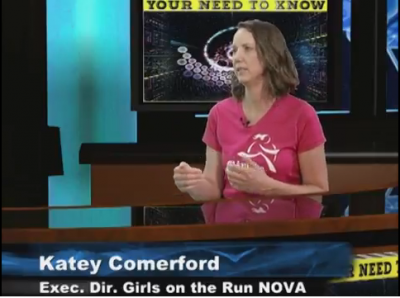 Initially the program was piloted using the services of the Northern Virginia Mediation Service (NVMS) in Westfield High School. In the 2010-2011 school year FCPS committed itself to a system-wide implementation of Restorative Justice policies in every school, elementary, middle and high school. Over 200 schools implemented the system with the aid of seven full-time restorative justice experts, including Vickie Shoap. FCPS has been applying Restorative Justice techniques to more than just their disciplinary process. Teachers have been trained in using the techniques to encourage students to talk with one another, share information and create a community, preventing incidents before they can happen in the first place. By getting students used to Restorative Justice Practices they also allow the process to move more smoothly when an incident does occur, as students are familiar with the concepts behind restorative justice, or even allow teachers to resolve incidents without escalating matters higher up. By cooperating with each other FCPS and NVMS have, with the aid of the Fairfax police, the county juvenile court and the county Neighborhood and Community Services office, expanded Restorative Justice programs for police referral. Over time law enforcement officials have become more excited at being able to refer offenders to the program and out of juvenile court, allowing minors to avoid tarnishing their records, provided they participate in good faith. Initiating a Restorative Justice case is far simpler than going through the criminal system. Generally two 30 minute meetings are needed, each party involved, the victim and the offender, individually, followed by a longer group session involving everyone, including the police, victim and perpetuator, which answers three questions, what happened, who was impacted and how, and what should happen. The victim starts with laying out what they think should be done. At the end of the process there is a written agreement, reached between the offenders and the victims, where the perpetrator agrees to restitution ranging from apologies, to payment, to community service as well as agreeing to not reoffend. After the meeting is over the Restorative Justice Mediators keep a copy of the agreement and make sure that the perpetrator has followed through on what they agreed to. If the perpetrator fails to do what they agreed to then the case is sent to juvenile court. Restorative Justice is an entirely voluntary process one which a student or parent can chose to forgo, but data has shown that restorative justice tends to lead to better outcomes, even though it can not be applied to every situation. For example, when dealing with a shoplifting case the Restorative Justice program will bring the offenders together with the store owners and answer the three questions, what happened, who was affected and how to resolve the situation. The offender is told exactly what happens when they steal, even as little as one item, the whole process of checking inventory, loss of money having to employ security and other knock on effects. Then they ask, what are you going to do next time? They create a hypothetical situation where the offender is encouraged to think about what they will do if a similar situation occurs again, what if a someone encourages them to shoplift again, or other encouragement. Creating a plan, where rather than having to make a decision on the spot, the person knows ahead of time exactly what they would do in a given situation. They also create a space where the parents of the perpetrator can discuss what their experiences are, how hearing that their child had broken the laws and the morals they had attempted to teach made them feel. The Restorative Justice system is not available to every offender. The perpetrator only qualifies if they have no other criminal record, only first offenders. Offenses which lead to the restorative process commonly include thief, damage, trespassing and vandalism, but never capital offenses. The process only applies where there was a victim and an offender who has recognized that they have done something wrong. According to data collection since Restorative Justice becoming official police policy in June of 2017 the recidivism rate of offenders who go through the Alternative Accountability Program (AAP) is approximately 4-5 percent in comparison to the court system’s 40+ percent. NVMS maintains a database of what cases have been through the system and hope to use the information to improve outcomes even further. The FCPS Restorative Justice Initiative’s own data shows a far lower rate of repeat suspensions for students who go through the program, as well as a rising rate of students themselves asking for conflict resolution services. 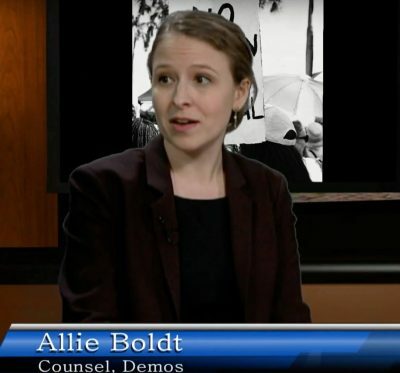 Every case is different, and the reactions of parents, victims and perpetrators vary greatly, but sharing viewpoints allows every side of the story come out and provide paths to a better outcome. For more information on the FCPS Restorative Justice Initiative visit https://www.fcps.edu/resources/student-safety-wellness/restorative-justice. For more information on NVMS and their Restorative Justice Program and the Alternative Accountabiliy Program visit http://nvms.us/restorative-justice/.